Who is paying for this expensive Road Salt? Rawhide. What is the big deal, this has been going on for a long time. See Oui Oui in the background on the portable restroom, ask Jose “Speedy” Gonzalez of Speedy Gonzalez landscaping and Oui Oui Enterprises (he thinks he’s fooling someone by having the company in his woman’s name) if he knows who’s stealing it. He’s a crook, those are probably his pickup trucks there!!! What is the location of this salt pile? It’s the strangest thing. The guy who called the Sun-Times anonymously a week or so ago seemed to know all about how the Duffs have been handling the city’s road salt contract for a Kansas City supplier for years. He made it sound like common knowledge, at least in those circles that would keep track of such things. But the folks at City Hall say nobody there even had a hint of any Duff involvement in the $4.9 million annual contract until they got a call from our reporters this week. This is in a city where perhaps the most politically sensitive product purchased every year is road salt, where the prevailing philosophy is that it’s the one commodity of which you can never really be accused of having too much during a Chicago winter. What makes me think then that somebody with the city was keeping track of every aspect of the Hutchinson Salt contract, including that it was subcontracting major portions of the hauling work to Duff- owned Curtis Storage and Trucking? Maybe it’s just the cynicism that sets in when you start to realize that the bad guys are always one step ahead in this town. Just when you think the feds have lowered the boom on the Duffs, knocking their janitorial companies out of the government arena with the investigation of how they fraudulently won $100 million in contracts through programs intended for women- and minority-owned businesses, you find they’re still guzzling from the public spigot through another company. Clearing roads of ice and snow has become such a fundamental part of life in cold-weather cities in North America that more than 10 times as much salt is used on roads as is used in food. But when all that salt melts ice and snow off highways, it washes into rivers and causes serious damage to local ecosystems. To combat this problem, Sierra Legal Defence will use a $75,000 grant to work with a Toronto-based watershed protection group, RiverSides, to examine the ecological costs of road salts. They will then advise the Ontario government of alternative strategies that use salt more judiciously as part of a more effective strategy for keeping the roads clear and minimizing traffic accidents, while reducing ecosystem impacts of winter road maintenance. In 2003, at the urging of a scientific advisory panel, Canada added road salt (which has been used to assist in highway safety since the 1930s) to its list of toxic substances that can be managed under federal environmental statutes. That prompted federal, provincial, and local officials to reconsider their road salt policies. The Ontario Department of Transportation, however, has a blanket exemption from environmental regulations related to the 2.7 million tons of salt it dumps onto its roadways each year. As it melts ice and snow, salt is carried in runoff into local rivers, groundwater, and the Great Lakes. The amount of dissolved salt that can get into the water greatly exceeds what is healthy. Even freshwater has some salt in it naturally, about 10 to 50 milligrams per liter, but water with a concentration of 250 milligrams per liter is unusable for drinking and toxic to plants. Kevin Mercer, executive director of RiverSides, says some bodies of freshwater can experience salt concentrations of more than 10 times that level. “There are some small streams adjacent to very large roads that receive constant applications of road salts which have been measured in the 30,000 milligrams per liter range,” Mercer says. “If you had four or five days of constant snow in an urban area like Chicago or Toronto, and there was constant salting, you could raise the chloride concentrations in tributaries that high. Eventually you start to lose species diversity. Salt contamination is a concern throughout the Great Lakes watershed. Milwaukee altered its road-salting policy in an attempt to minimize the amount of salt that eventually washes into Lake Michigan. The city has reduced salt application on side streets and salts only when necessary on main streets, bridges, intersections, and particularly slippery areas. Other substances can melt ice, but those chemicals are expensive. Calcium magnesium acetate has none of the long-term impacts of salt but costs about 20 times as much as salt. Magnesium chloride is not as harmful as the more common sodium chloride but costs five times as much. Sadhu Johnston, Chicago’s environment commissioner, pointed to people breathing salt dust, deteriorating infrastructure, and killing of grass and trees near roads as some of the problems caused by road salt. 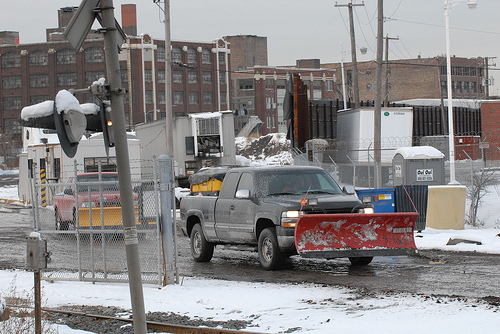 Chicago is working on ways to use alternative chemicals while keeping costs down, and last winter the city tested a liquid deicer used prior to snowfall. The 25 percent magnesium chloride solution is mixed with a corn-based substance that inhibits corrosion of the streets. So far, it has worked well in limited use. “The pilot we did last year showed that it does work but the cost is probably going to be prohibitive for citywide usage,” Johnston says. “After doing the pilot last year we’re looking at how we could expand it into select areas such as bridges, along heavily landscaped areas, and storm sewer areas that discharge directly into a body of water. Was this the Chicago lot or the one next door. I hope you have the plates and more pics. (Response) I do I do!!!!! I think you got your facts crossed on this one,there is a private outfit next door that sells to contractors. did you actually see them getting loaded with a city owned highlift or did u just assume they did when u seen them comming out of the lot? I find it hard to believe that anyone would be stupid enough to do this in broad daylight with the spot light on everything thats going on. (Response) Please more pictures soon. Thank you for posting this. I was just rear ended on my intersection, which has not been salted or plowed since it snowed days ago. I saw an accident at the same location this morning. The officer on the scene at the accident this morning called streets and sanitation this mornig, and was told that they put the location on their list. You can stand outside and watch car after car slide into the intersection, even the ones that are going very slowly. It is as slick as an ice rink.